Andrographolide is an active diterpene lactone of herb Andrographispaniculata(burn) f.nees, one of the world’s most important medical herb. 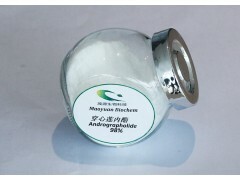 Andrographolide is applied in Chinese and Ayurvedic medcine for gastric disorders, colds, influenza and other infecious diseases. In dietary supplements,this bitter-tasting andrographolide acts important role for immune strength and liver support. In beauty industry, andrographolide is for soothing, skin lightening, prevention of dark circle and spot prevention.